Calling all Creatives! It’s time to join us in celebrating the women in our lives… and be in with a chance to bag yourself 1,000 Printed Points, plus a small print run of Greeting Card designs, just by tagging us in your designs using #GDayPrinted. In just a few short days, Galentine’s Day will be upon us, and here at Printed.com, we’re on the hunt for the ultimate Galentine’s Day-inspired greetings card. Originating from US sitcom Parks and Recreation, the February 13th celebration is a chance to celebrate the women in your life. It’s a day for celebrating the love you have for your lady friends, whether they’re single or not. As Leslie Knope says “Every February 13, my ladyfriends and I leave our husbands and our boyfriends at home, and we just come and kick it, breakfast-style”. All you need to do to be in with a chance to win is tag #GDayPrinted in your February 13th themed creations over on Instagram for your chance to win a print run of your design and 1,000 Printed Points. Whether they’ve already been brought to life in print or they’re a graphic ready for its debut, we’re asking our talented followers to spread the Galentine’s Day love while getting creative. We are very proud to be continuing #KatieDonates into the new year! Thanks to everyone who supported the project last year and we hope it's even more successful in 2019. This month Katie's sister Rachel donates to the @plan_uk "Because i'm a girl" campaign. "I have chosen this charity as I believe as a mum of 2 independent little ladies, more needs to be done on equality for girls. We need them growing up in an environment they feel equal, as well as feeling safe and secure. The need to feel that they can stand up for what they believe in. This campaign aims to tackle real issues girls and young ladies across the globe face daily." 100% of profits will go to Rachel's chosen charity. Probably my favourite of the new range. Just leaving it here for anyone who is looking at making changes in the new year, or for anyone who is just keeping going as marvellously as they are now. Oh Squirrel was my New Years resolution a few years ago… so I quite like to share this each year for anyone who has a dream to start their own business. I turned my hobby into my livelihood, and it’s been a long and fun journey. If I have time tomorrow I’ll put some of the early journey in stories as it’s come a long way! My 2018 resolution was to always have Tequila in the house, and I’m proud to say that it’s the 31st December and there’s still half a bottle to enjoy this eve! Duty free top ups have ensured there’s been a margarita on offer for all guests this year. Whatever you’re upto tonight, look after yourself and have a good one! The designer whose entry is selected as the winner will receive 1,000 Printed.com Points, credited to their Printed.com account. The designer will also a limited print run of 50 Cards of their creation. Your design can be submitted and tagged however you choose (i.e. in Flatlay or lifestyle photography) but please bear in mind that we will need press-ready artwork for printing if you are chosen as the winner, with the bleed area included. Submit your entry via Instagram @printedcom, alongside the hashtag #GDayPrinted. Please make your profile public too so everyone can see your wonderful work! Any entries uploaded after 10am on February 13 2019 will not be considered. There will be one winner selected after the deadline of 10am February 13 2019. We will also compile a shortlist of entries to promote on the Printed.com website and on social media. In addition to 1,000 Printed Points the winner will receive a short print run of 50 Cards, featuring the winning design. After 10am February 13 no further entries will be accepted for judging. Open to UK and Ireland based entries only. All entries agree to the use of their name and artwork and associated business contact information in any publicity material. Any personal data relating to the winner or any other entrants will not be disclosed to any third parties. If you submit a design, you give us permission to share your design on social media and throughout the Printed.com website. No cash alternative to the prize will be offered. The prize is non-transferable. We reserve the right to substitute any prize with another equivalent value without notice. b) the submitted design is not false, inaccurate, misleading, fraudulent, unlawful or defamatory. c) the image provided becomes the property of Printed.com for the use of this seasonal direct mail and will not be used by Printed.com any further. This promotion is not endorsed or administered by or associated with Instagram. 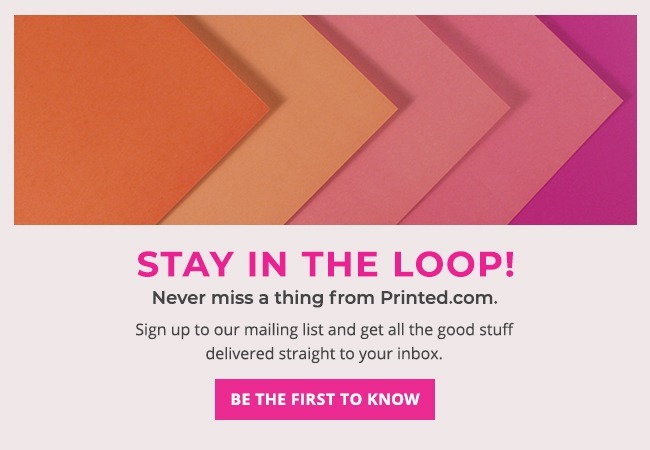 You are providing your information to Printed.com and not to any other party. The promoter is Printed.com, whose registered office is Threeways House, 40-44 Clipstone Street, London, W1W 5DW.